Add another black mark to Canada’s environmental image around the world: The country now leads the planet in the degradation of untouched forests, according to a study from Forest Watch. Some 8 per cent of the world’s virgin forests were degraded between 2000 and 2013, according to the study. That’s 104 million acres, or an area about three times the size of Germany, Forest Watch said. “That means human activities disturbed 20,000 hectares of pristine forest every day for the past 13 years,” the group said. Of that degradation, more than a fifth — 21.4 per cent — occurred in Canada, the study found. That’s more than any other country. Russia, in second place, accounted for 20.4 per cent of the damaged or destroyed virgin forests, while Brazil, site of the Amazon rainforest, accounted for slightly more than 14 per cent. The study was put together with the participation of the University of Maryland, Greenpeace, the World Resources Institute and other groups. Researchers analyzed detailed satellite imagery to locate “intact forest landscapes,” as they are known, around the world, and then tracked their progress from 2000 to 2013. The imagery shows severe loss of forests in the northern parts of the Prairie provinces, including around the oilsands operations near Fort McMurray, Alberta. Very little new forest coverage has been added to compensate. The interior of British Columbia has seen widespread forest loss, as have parts of northern Ontario and northern Quebec. Only the Maritimes showed evidence of any significant reforestation. 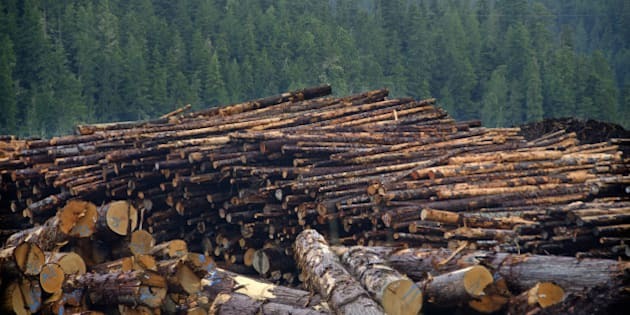 By Forest Watch's calculations, logging was worth some $21.5 billion to Canada's economy in 2011, accounting for 1.2 per cent of all economic activity. Not all the degradation is due to logging — some of it is due to forest fires, which Forest Watch’s Lee blames on climate change. Not all the degraded areas indicate total loss of forest. About three-quarters of the degraded areas around the world suffered from “fragmentation” — a thinning out and breaking up of forested areas due to logging. “The fragmentation of IFLs is problematic because smaller, more isolated forest patches will lose species faster than those that are larger or less isolated,” Forest Watch said on its blog. The study calls on government officials around the world to direct logging activity away from untouched forests, and urges businesses “with sustainability commitments” to steer clear of virgin-forest products when making purchasing decisions. The interactive map below was provided by Forest Watch. The areas in pink indicate degraded forests; areas in blue indicate reforestation.